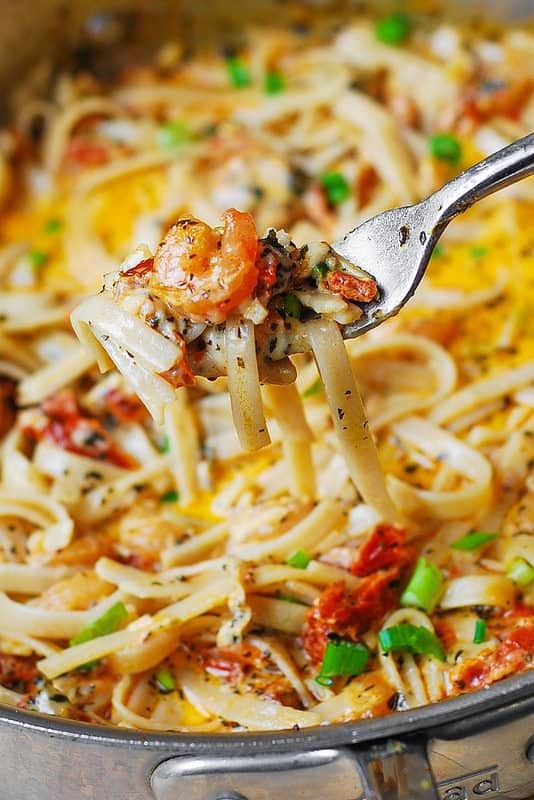 Garlic Shrimp and Sun-Dried Tomatoes with Pasta in Spicy Cream Sauce – a delicious, Italian-inspired seafood pasta recipe. 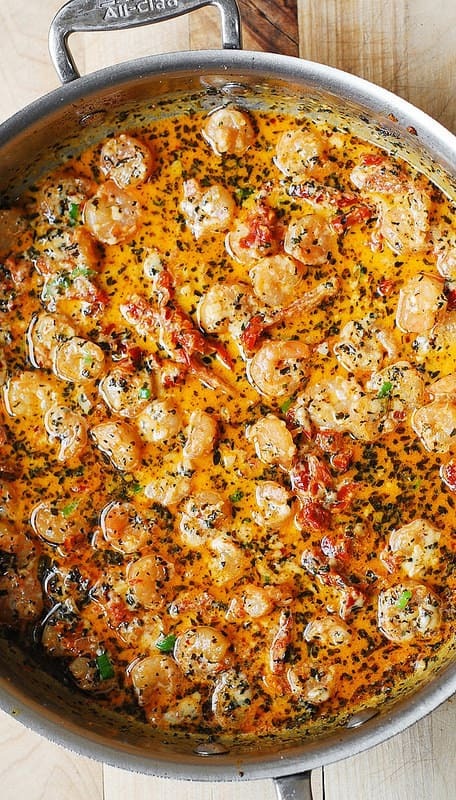 If you want to make something different with shrimp, try this recipe! It’s easy and you’ll love it if you like sun-dried tomatoes. 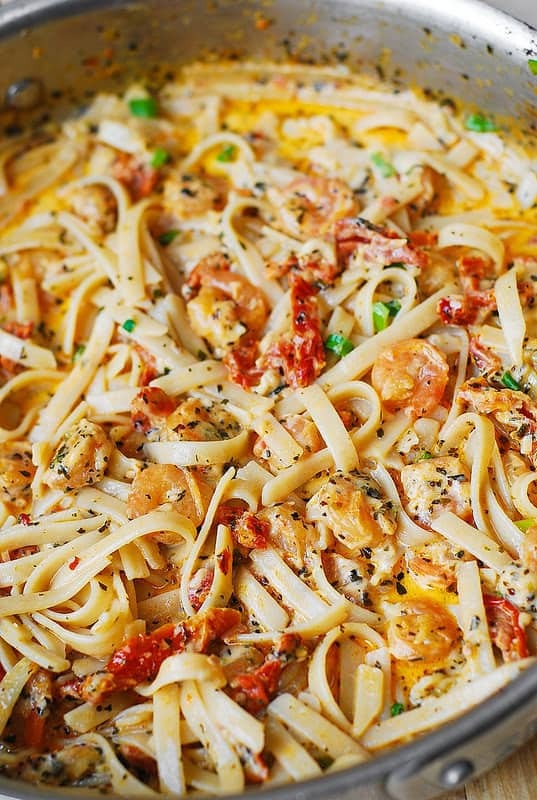 There is lots of sauce in this seafood pasta. Be careful not to overcook the shrimp (which is easy to do). But even if you do overcook the shrimp, there is so much cream sauce, you won’t even notice if the shrimp does get rubbery. That’s the beauty of this recipe. 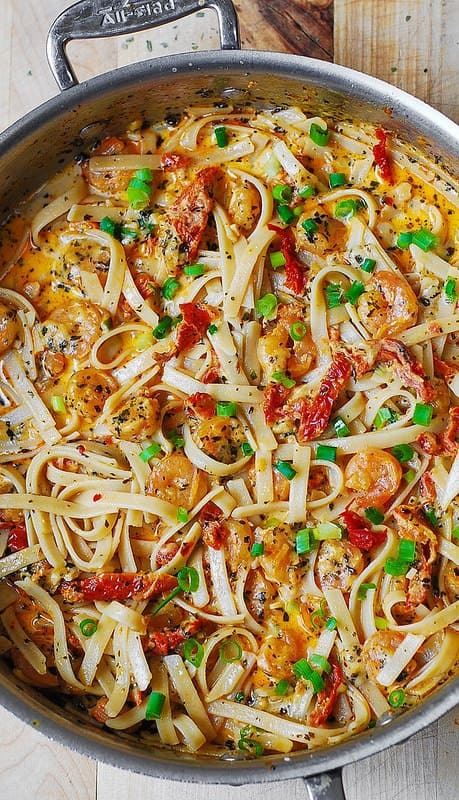 Garlic Shrimp together with Sun-Dried Tomatoes is smothered in Spicy Creamy Sauce and served over fettuccine pasta. With everything spiced up with basil and crushed red pepper. Italian-inspired comfort food that’s super easy to make! This is an Italian-inspired seafood pasta recipe with lots of flavors at play. 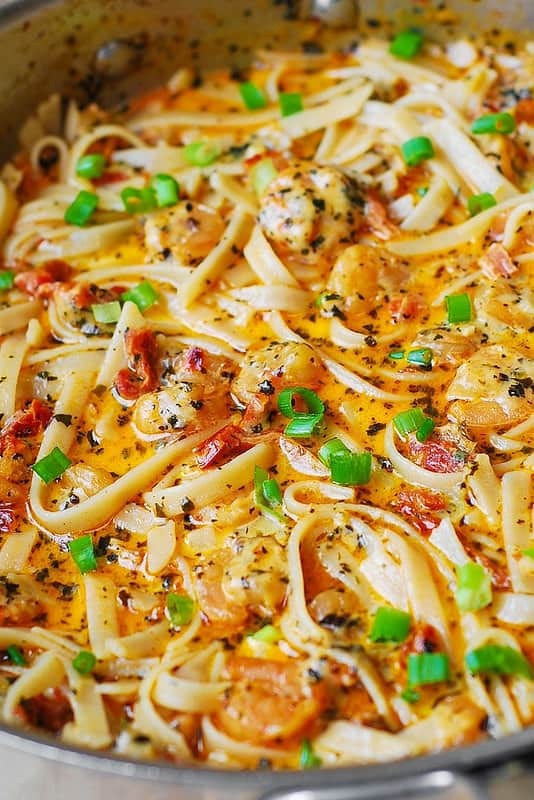 Garlic Shrimp together with Sun-Dried Tomatoes is smothered in a lot of Spicy Creamy Sauce and served over fettuccine pasta. Everything spiced up with basil and crushed red pepper. YUM! In a large skillet, saute minced garlic and sun-dried tomatoes (drained from oil) in 2 tablespoons of oil (reserved from the sun-dried tomatoes jar - see note above) for 1 minute until garlic is fragrant. Add half and half, basil, and crushed red pepper to the skillet with shrimp, bring to boil and reduce to simmer. Whisk the Parmesan cheese into the hot cream and stir to melt cheese, on lowest heat setting, until cheese is melted. Remove the sauce from heat. Add more salt, basil and more crushed red pepper if desired, to taste. In the mean time, cook pasta according to package instructions. Drain (reserving some pasta water). Add cooked pasta to the creamy mixture, add more salt, basil and more crushed red pepper if desired, to taste. can you make the sauce the day before? This dish was amazing! Added a little pasta water at the end and mmm mmm good! 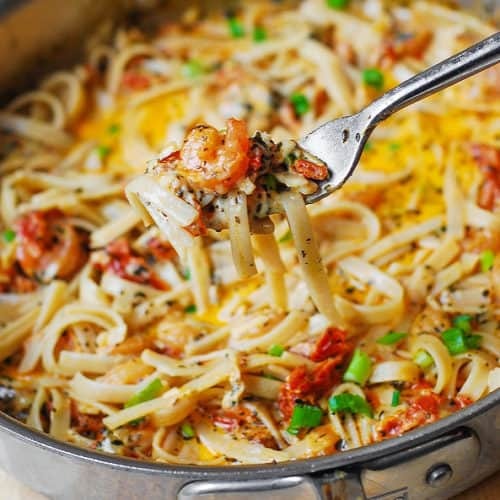 I followed this recipe thoroughly and it was absolutely delicious, used freshly caught shrimp since I live in the coast. What caught my attention is that my pasta looked nothing like the picture, mine was much creamier and thicker. I am so happy you liked this recipe! The whole recipe makes 4 servings. This sounds amazing,but I don’t eat seafood,could I use chicken instead?? Yes, you can use chicken. Saute chicken until it’s cooked through instead of shrimp. 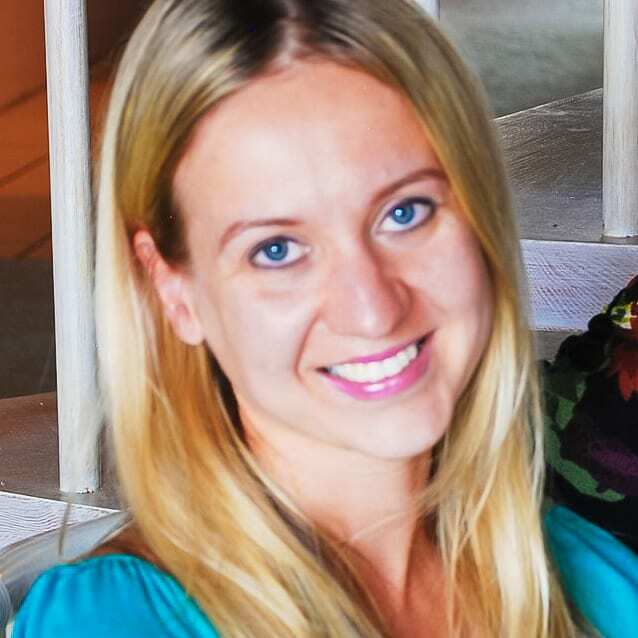 Julia, we loved this recipe! I used rigatoni. It was perfectly spiced and amazing. Easy too. Thank you for another fabulous meal. You are very welcome! I am very happy you enjoyed this recipe! My favorite recipe!! I add Italian sausage to mine! What a great idea to add sausage! This is a wonderful blend of ingredients! Full of flavor! I am going to make this again and again. Thank you Julia, this is awesome!